The Mini Peterbilt Truck is FULLY FUNCTIONAL! - Muscle Cars Zone! The Mini Peterbilt Truck is FULLY FUNCTIONAL! This Mini Peterbilt Truck is ideal for heavy transport for things such as logs. Are you a fan of mini vehicles? Do you enjoy watching them in action, especially if it is a truck of some sort? If you are that guy then we have the right thing you are looking for. Take a look at the following video and see how this Mini Peterbilt Truck is set to action out there in the woods. Not only it is capable of being driven, it can also transport goods! You can place logs onto the trailer. It can fit up do dozen of them depending on the thickness. The truck has all the little bits and parts you regular truck has, such as the classic exhaust, the grill and all of the chrome details. It also has the proper number of set of wheels. So how does it work? Well, first things first, you have to secure the logs in place, just like you would do with your regular size truck. Using several chains, which by the way are kept inside the truck in a small compartment, which go over, the logs are tightly secured. Then using a remote control, the truck is slowly moved to the desired direction. It can go left, right and backwards too! 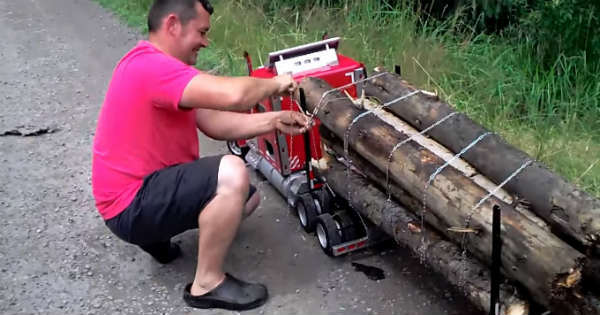 Though this might not be the most efficient and fast way to transport logs, it sure is one of the most entertaining. The Mini Peterbilt Truck is something every lodger would love to have in his personal collection. What do you think; could this expensive toy be, to some extent, useful? At last, check out the father of this mini truck -- the massive 2000 Peterbilt 379!